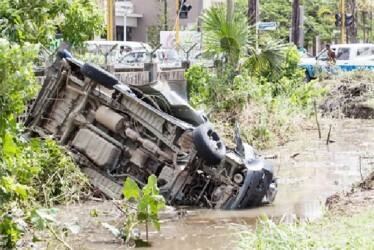 An overloaded minibus plunged into the trench at the corner of Homestretch and Mandela avenues yesterday afternoon after its brakes apparently failed. There was no serious injury. 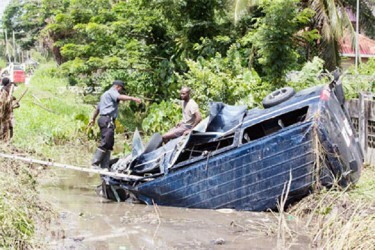 The driver of the Route 48 bus and the conductor denied that the bus was overloaded; however passengers and onlookers at the scene of the crash told Stabroek News that there were 19 passengers including children. 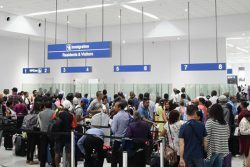 None of the passengers was severely injured but a few were checked by medical professionals at the Georgetown Public Hospital Corporation. The accident occurred at around 1:30 pm. When Stabroek News arrived on the scene police had already taken into custody the driver of the bus for questioning. One witness stated that the bus was “barrelling down” Homestretch Avenue when the driver made the decision to run off the road to stop the vehicle as the brakes had failed. The witness stated that the bus travelled approximately 50 feet once the driver hit the edge of the trench, “flipping over” once it hit the water and “bouncing” until it stopped. The bus, plate number BNN 8352, was severely damaged, but passengers were able to evacuate quickly. At GPHC, disgruntled passengers were heard condemning the driver. While emotions were high after the crash passengers were happy to be alive and without injuries in what could have been a fatal accident. There have been repeated calls for police to clamp down on overloaded and speeding buses across the country. The police have remained steadfast in their assertion that there is zero tolerance for traffic violations.